As soon as I read Heidi’s post about Figgy Buckwheat Scones at my favourite recipe blog, 101 Cookbooks, I knew I had to own Kim Boyce’s new cookbook: Good to the Grain: Baking with Whole-Grain Flours . Holy yum, I was inspired by all of the recipes with alternative flours: amaranth, barley, buckwheat, kamut, quinoa, spelt, and teff. But I got stuck on the first recipe in the book, and what did I start with? Wheat. How dull. 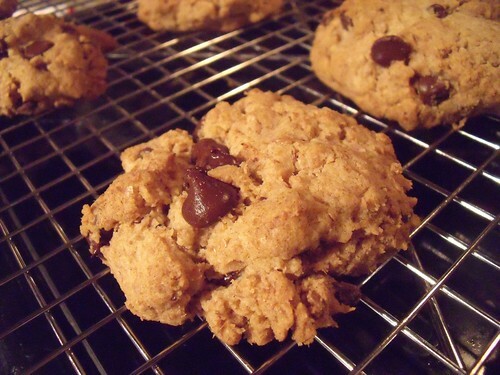 But Whole Wheat Chocolate Chip Cookies sounded like a pretty nice place to start. Kim promises that the whole-wheat flour gives the cookies “a distinctive, nutty taste” and as I am all over that, the recipe caught my eye and kept coming up whenever I thought I wanted a treat. Last night the boyfriend asked if we had something with chocolate, and it was more than I could bear not to bake these. In 30 minutes from start to finish we had 12 warm and divine cookies, and two logs of dough in the freezer for warm cookies next time we have a craving. I think there was a bit of “user-error” when I “scooped mounds of dough about 3 tablespoons in size onto the baking sheet” — I should have smushed the dough down a bit, but ignored my instincts and got tall rather than wide cookies. I quite liked them this way, and when I bake the next batch I’ll actually do some this way and some smushed so I can compare. The only change I made to the recipe, was to use raw sugar instead of dark brown sugar, as it’s what I had on hand. This may too have contributed to the “tall not wide” factor, but they tasted awesome. Ah, I also used chocolate chips instead of chunks. I can’t wait to try some of the other recipes in this book: the Quinoa and Beet Pancakes are calling my name, and I think the Blue Cheese and Onion Scones would be perfection when company comes calling. Several of the recipes also use some all-purpose flour, which surprised me coming from a “whole grain” baking book, but I’m going to do some experimenting and see if I can get the white stuff out of there entirely. 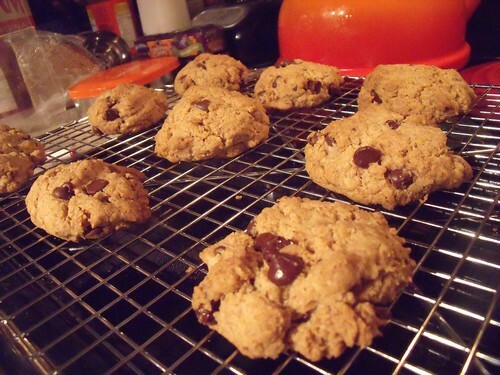 These cookies were an easy start, as they were already entirely whole wheat. Next step: getting the white sugar out too! From the fabulous Good to the Grain: Baking with Whole-Grain Flours , makes about 24 cookies. Preheat oven to 350F. Prepare two baking sheets with butter, a Silpat, or parchment. In a stand mixer with the paddle attachment, combine butter and sugars on low until just combined. Add the eggs, one at a time until incorporated and add vanilla. Add flour mixture, and continue on low speed until just mixed, about 30 seconds. Add chocolate chips and mix until they are evenly distributed throughout the dough. Take the bowl out of the stand mixer, and use your hands to smush it all together. It will go from crumbly to cookie dough quite quickly. Scoop 3 Tbsp. balls of dough onto the prepared baking sheets, smushing the balls down to flatten them slightly. Place 6 cookies on each baking sheet, leaving lots of space between them. Bake for 10 minutes, rotate the baking sheets, and bake for another 10 minutes. Either repeat with the remaining dough, or roll into plastic-wrapped logs and freeze for later, keeping in mind that the cookies are best eaten warm, straight out of the oven. Oh my, I think I need that cookbook, and those cookies… Yes, whole wheat and chocolate– the perfect complement to each other!